Phosphorous: From Latin phosphorus "light-bringing," from Greek Phosphoros "morning star," literally "torchbearer," from phos "light," contraction of phaos "light, daylight" + phoros "bearer," from pherein "to carry." Long before mankind had developed methods of bombarding phosphorous compounds with electron beams to make them glow, 17th-century scientist Hennig Brand observed the characteristic light emitting property of phosphorous when exposed to oxygen. No doubt the Ancients noticed the naturally occurring glow of bioluminescent plants and animals, and maybe even luminescent glow caused by the breaking open of phosphorous-containing rocks. Radioactive decay in the vicinity of phosphorescent materials can also cause a detectable glow. 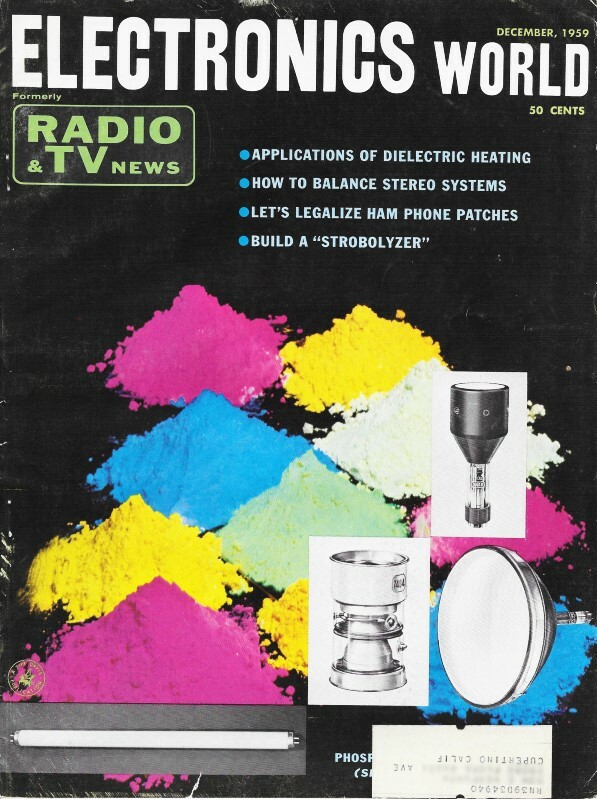 Phosphors, the subject of this 1959 Electronics World article, include both phosphorescent and luminescent materials, provided the medium for electroluminescent displays like the cathode ray tube (CRT). Some early electronic display devices used whacky electromechanical apparati to sling light beams around using whirling plates, mirrors, and pencil beam light sources. David Fortney, of the Sylvania Electric Products company, a maker of CRTs and TVs, provides here an introduction to phosphors. Fig. 1 - Energy distribution of fluorescent lamp phosphors. Fig. 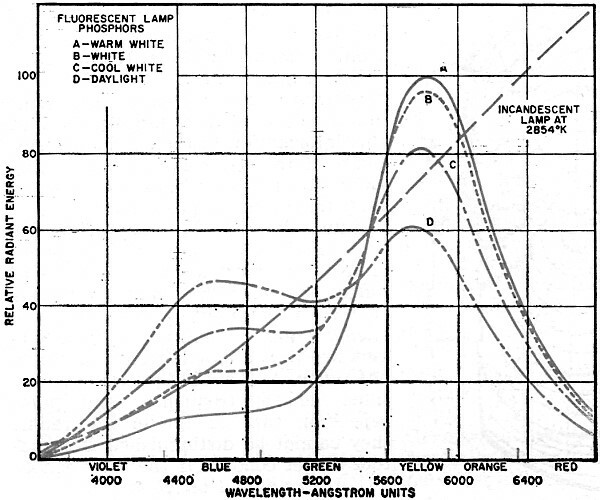 2 - Energy distribution of various white lamp phosphors. Chemical & Metallurgical Div., Sylvania Electric Products Inc. These remarkable fluorescent powders have made possible great advances in lighting and in visual communications. Twenty-five years ago the making and use of fluorescent powders called "phosphors" or "light bringers" as well as the phenomenon of luminescence, while long well-known in the laboratory, had little significance to most people. 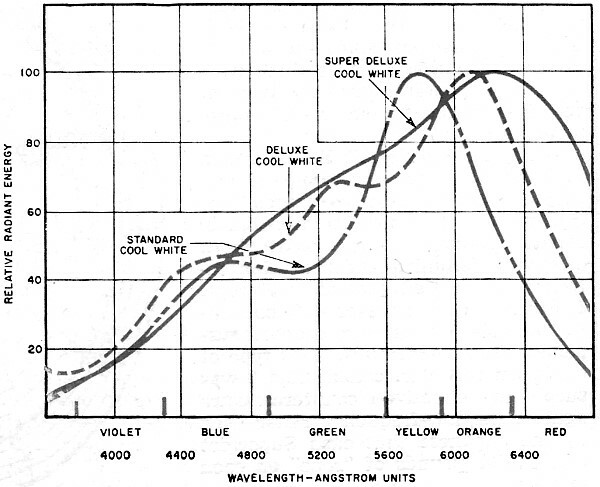 Phosphors had few practical applications beyond the oscilloscope and the x-ray intensifying screen. We lighted our homes, offices, and factories with incandescent lamps. We had no television sets in our living rooms. During these twenty-five years, fluorescent lighting has enjoyed universal acceptance while the TV set is now a standard item of furniture in the American home. Luminescence, in lighting and in the television picture tube, has become as commonplace in our generation as the radio during our parents' time and as the incandescent lamp from the turn of the century to the first World War. Phosphors, the light producing powders which make possible these advances in lighting and in visual communication, are inorganic materials which have the special property of absorbing energy in the ultraviolet range (lamp phosphors), from fast-moving electrons (TV picture tubes), or in a changing electric field (electroluminescence). Some of the energy so absorbed raises the electrons to higher energy states within the phosphor activator centers. 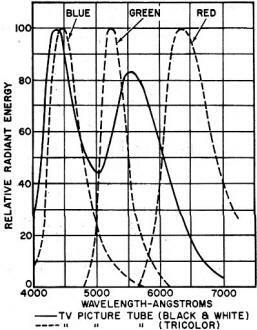 When these electrons return to lower energy states, the energy is released as radiation of longer wavelength in the visible range of approximately 4000 to 7000 angstroms (400 to 700 millimicrons), or, in some cases, in the region of 3650 angstroms. This latter emission may be used to excite organic "black-light" paints or pigments. 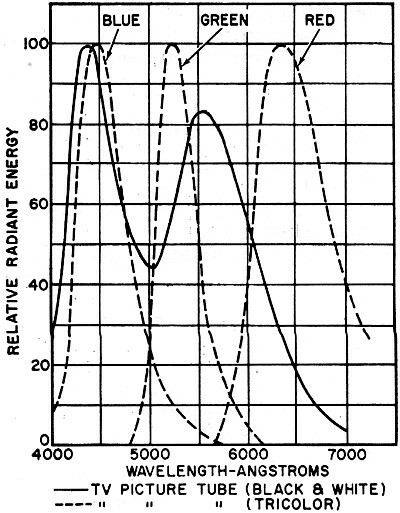 Visible emission from phosphors is ordinarily not monochromatic or in a narrow discrete band, but occupies a wide band having a spectral energy distribution curve of a "mountain peak" shape (see Fig. 1). In general, lamp phosphors are inorganic silicates, borates, tungstates, and phosphates, usually activated by manganese, antimony, tin, or lead. Those used for TV picture tubes are sulfides of zinc and cadmium activated by silver, while the electroluminescent phosphors are copper-activated zinc sulfides. Barium silicate is a well-known "black-light" phosphor. The color of a so-called "white" fluorescent lamp is designated by its color temperature, so that basically any lamp whose color falls on or near the so called black body line is considered a "white" lamp. There has been and there still is considerable confusion for the user because there are so many varieties of "white" lamps. Table 2 helps clarify the situation and emphasizes that one of the most important advantages of fluorescent lighting is color control. Fig. 3 - Radiant energy of CRT phosphors. At the present time, by far the most popular lamp is the high efficiency "cool white" lamp, although large numbers of the other colors are in use for specialized applications. It should be understood that 4500° "cool white" lamps, for example, all look the same color to the eye, whether "standard," "deluxe" or "super deluxe." The differences arise in the appearance of objects under the various lamps. These differences are shown by a study of the spectral energy distribution curves in Fig. 2, in which the three "cool whites" are compared. The standard lamp is weak in red and green-strong in yellow. The "deluxe" is stronger in red and green. In the "super deluxe" lamp, the red is greatly increased and the colors are better balanced. In the early days, manganese-activated zinc beryllium orthosilicate was the basic "white" phosphor used by all lamp makers. Actually this material is not a single phosphor, but a family of phosphors. By varying the Zn/Be ratio and the manganese content, the color could be varied from a brilliant green through white to a pinkish color. Blue-white magnesium tungstate was blended with the silicate to adjust the color as desired. Other important lamp phosphors which have been used for some years, either as color correction phosphors for white lamps or for the production of colored fluorescent lamps or sign tubing, are given in Table 1. At present, the blue-white magnesium tungstate has been largely replaced by titanium-activated barium pyrophosphate, and the other blue tungstates by strontium pyrophosphate, tin activated. Both of these important phosphors were developed in Sylvania's laboratories. Because of the toxic nature of, the zinc beryllium silicate, the lamp industry in America and England completely discontinued its use in 1948, although it is still being used in some projection-TV picture tubes. Almost overnight, calcium halophosphate activated by antimony and manganese ("halo" because it contains the halogens, chloride and fluoride) was used exclusively. Like the silicate system, it is not a single phosphor, but a complex family in which some color variations can be made by changes in "mol ratios" or activator concentrations. The primary activator, manganese, gives rise to the emission of a red band, in conjunction with the secondary activator or sensitizer, antimony, emitting in the blue region. This month's cover shows a number of piles of Sylvania phosphors employed in the electronics and lighting industries. Under normal illumination these materials look like ordinary white powder. However, when illuminated by ultraviolet or when a thin film of the powder is excited by an electron beam, light of various colors is produced. In photographing our cover, we illuminated the white phosphor piles with four 15-watt ultraviolet lamps in order to produce the colorful effect shown. A yellow filter was used for color correction to remove the bluish cast that would have been produced. Probably the most common use of phosphors is in the ordinary fluorescent lamp shown at the lower left of the cover. When current passes through the lamp, some ultraviolet radiation is produced. This excites the phosphor that coats the inside surface of the long glass tube. As a result, the phosphor glows brightly and gives off visible light. The three electron tubes shown on the cover are all RCA types that employ various types of phosphors. The tube at the lower right-hand corner is the 21CYP22 color picture tube. This is the conventional three-gun shadow-mask type that uses a tricolor phosphor-dot screen. The screen is composed of an orderly array of small, closely spaced, phosphor dots arranged in triangular groups, or trios. Each trio consists of a green-emitting dot, a red-emitting dot, and a blue-emitting dot, and is aligned with a corresponding hole in the shadow mask. When the three electron beams in the tube cause these dots to be illuminated in various mixtures and combinations, a full-color picture is produced on the screen. Directly above the color picture tube is a type 7448 display storage tube. This 5-inch tube produces a bright, non-flickering display of stored information for as long as 40 seconds after the image has first been produced. The tube utilizes two electron guns - one for writing and the other for viewing. The writing gun produces a beam that applies the pattern to a thin storage grid located just behind the tube's faceplate. The pattern is in the form of a distribution charge on this grid. Then a high-current, low-velocity beam from the viewing gun transfers the charge pattern on the storage grid to a highly efficient phosphor screen where an intense visible pattern is produced. Because of the high efficiency of the phosphor and the fact that it is continuously excited, rather than intermittently as in ordinary CRT's, a very bright, non-flickering display is produced. Just to the left of the color picture tube is a small type 7404 image-converter tube. This tube is used with suitable optical systems for viewing an object or specimen irradiated with ultraviolet radiation, as in ultraviolet microscopy. The object to be viewed is focused by optical means on a semi-transparent photo-cathode at one end of the tube. Electrons from this image are electrostatically focused on the fluorescent electron-optical methods. The resultant reduced image can then be viewed with an optical magnifier. (1) Type 7448 display storage tube. (2) The 7404 image-converter tube. (3) The 21CYP22 color picture tube. 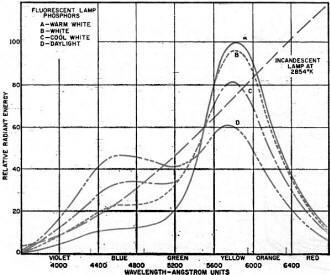 As color rendition became a more important factor in lighting, the calcium silicate phosphor was used as the major component in the deluxe series of phosphors. In 1954, the super deluxe cool white lamp was introduced, which provides the best rendition of color yet obtained with fluorescent lamps. The basic phosphors for this lamp, both developed by Sylvania, are calcium strontium orthophosphate activated by tin, subsequently replaced by the brighter calcium zinc orthophosphate: tin activated. In 1956, in response to demands for higher illumination for virtually all seeing tasks, Sylvania introduced the VHO (Very High Output) lamp, which produces two and one-half times as much light as conventional lamps of the same dimensions. This important development makes possible the extension of fluorescent lighting into medium and high bay industrial lighting, as well as for outdoor applications such as street lighting, parking lots, etc. While each lamp contains only a few grams of phosphor, the amount of phosphor required by the industry each year adds up to many tons. The phosphor is applied to the inside of the lamp as a lacquer suspension, from which, after the solvent has evaporated, the lacquer is baked out, leaving the phosphor adhering to the glass in a smooth, uniform coat. The raw materials for phosphors must be of exceptional purity. Accordingly, purification procedures are always a vital part of the precipitation of phosphors or phosphor component raw materials. In general these are made as pure as possible, then the desired amount of activator added in the form of a suitable compound. Control of crystal structure and crystal size distribution are also important in many materials used in compounding the phosphate phos­phors. Phosphors are usually prepared by the homogeneous dry mixing of the purified constituents in the required proportions, followed by a heat treatment in the range of 1800 to 2000°F. Oft times control of the atmosphere is necessary during such "firing" to provide oxidizing, reducing, or inert conditions in the furnace. The newest family of phosphors, electroluminescent phosphors, are used in solid state "cold light" lamps manufactured under the name "Panelescent" by Sylvania.1 These phosphors are already manufactured in ton quantities for applications such as in automobile instrument panels, night lights, and highway signs. These phosphors are largely zinc sulfide having activators such as lead or copper. "Panelescent" lamps are made by imbedding the phosphors in a ceramic glaze resulting in years of continuous service at low cost. As new needs arise in the lighting and electronics industries, the development of suitable phosphors to meet these needs will also continue. 1 Martin, A. V. J.: "Electroluminescence - Light of the Future," Radio & TV News, January, 1958. (Left) Table 1. Composition of phosphors for colored fluorescents. (Below) Table 2. 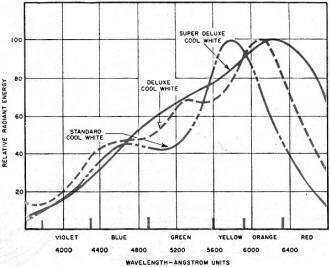 Color temperatures for various white fluorescents.